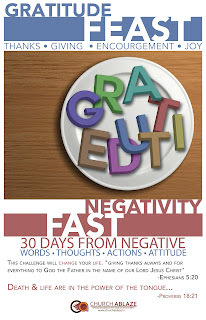 We are half way there on Day 15 of our 30 day Negativity Fast and Gratitude Feast. What better way to stay motivated, than with a visual reminder. I have attached a link below so you can download a high resolution pdf to print and put up as a reminder. Click here: 11x17 High resolution poster. Try and go as many days as you can negative free. If you blow it just get up and try again.